Two weeks back I was exhausted, melting snow at 5500m to drink and prepare some food before it gets dark. I felt quite tired but happy to have plenty of time on the following day to recover at Camp2 before doing a summit push up to Camp3, followed by our summit day. I was trying to get everything organized before hitting my sleeping bag when I got the worst news: weather forecasts declared the following day too dangerous for us to stay at high altitude. One more snow storm was expected to leave one meter of snow on high camps, making the descent in case of difficulties extremely dangerous considering the size of our team and all expedition gear to be carried down the mountain. We could not believe such thing while staring at the beautiful sunset… we so much regretted not having alternative forecasts from other providers. But we could not think on any other thing than escaping from the avalanches down to secure heights. Retreating to Camp2 to retry our summit push was not an option considering our countdown to take the helicopter back home had already started. Avalanches…. I have never in my life seen so many in such a short period of time. They are one of the most beautiful phenomenon you can contemplate up in the mountains…. a dire need for the mountain of releasing the most powerful forces one can see in a natural environment. 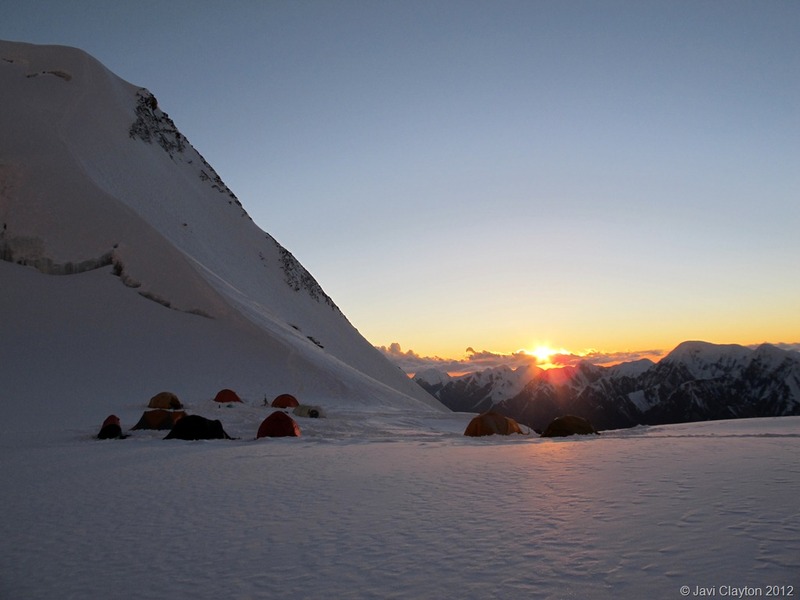 During our first night on high camps, four days back up to 4500m, the weather turned from a lovely sunny day into a stormy night leaving about 30 cm of snow, followed by a hot and cloudy descent that could scare the most experienced climber. That morning we decided to cancel our plans for moving from Camp1 to Camp2, and instead we went down to Base Camp to supply ourselves with the extra food, gas and gear required for our summit push. Going down that morning on melting snow slopes while listening to the power of avalanches was a worrying start of our expedition. Right after our descent, a climber from other team was partially avalanched, and the staff at BC told us about a similar incident that happened some days prior our arrival. We were climbing a mountain which main cause of fatality is avalanches, you can read that in the climbing books, and you can tell when you have your camera full of photos of these beautiful collapses. This is how this story ends, knowing that we did the best for us, even if we felt like giving up easily… but now I can plan for bigger adventures since I learnt loads of things on the field, and I had once again the bittersweet taste of challenging myself and mother nature in a real mountain.